Question: where do you think the photograph of this new sign was taken (click on the photo for a better look)? (Scroll down if you want the answer). Answer: It’s on the start of the Greenway walking path. Right by Wick Lane. Near to the Olympic Stadium. In Fish Island. Which is in Bow. So why is the sign pointing tourists away from Bow and sending them to Stratford? And telling them that Bow is 1.75miles away when it is in Bow? Others further along the Greenway also send walkers and cyclists on a wild goose chase. Crikey, what’s wrong with Bow? 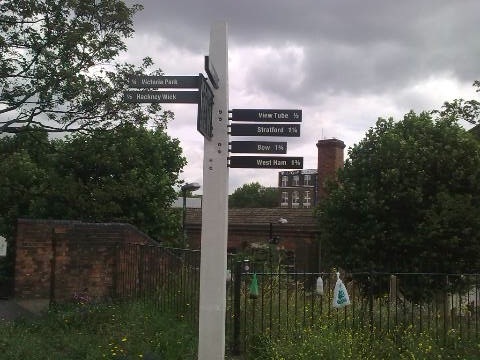 Tower Hamlets Council’s planning department told me they gave planning permission for the signs to be erected, but what was written on them was someone else’s fault. And these people are organising next year’s Games…. P.S. What is it about people who hang carrier bags of dog dirt on railings?